We’ve been dealing with some pretty icy and cold conditions in Dallas this last week. I can feel the laughter from my school friends in Colorado and Virginia; surely a little ice isn’t going to slow us Texans down? But it does. Oh yes, it does. When the temperatures drop below freezing, everyone in the city seems to change personalities. Cabin fever sets in as we wait for ice to melt, so we can venture onto the roads. Not to the grocery store, mind you. Those shelves have been bare for a week. No eggs, no bread, no milk. No point in trying until we know the trucks can get through to stock the shelves. So at Sweeney’s on the Creek, we mostly stay inside and try to stay warm. 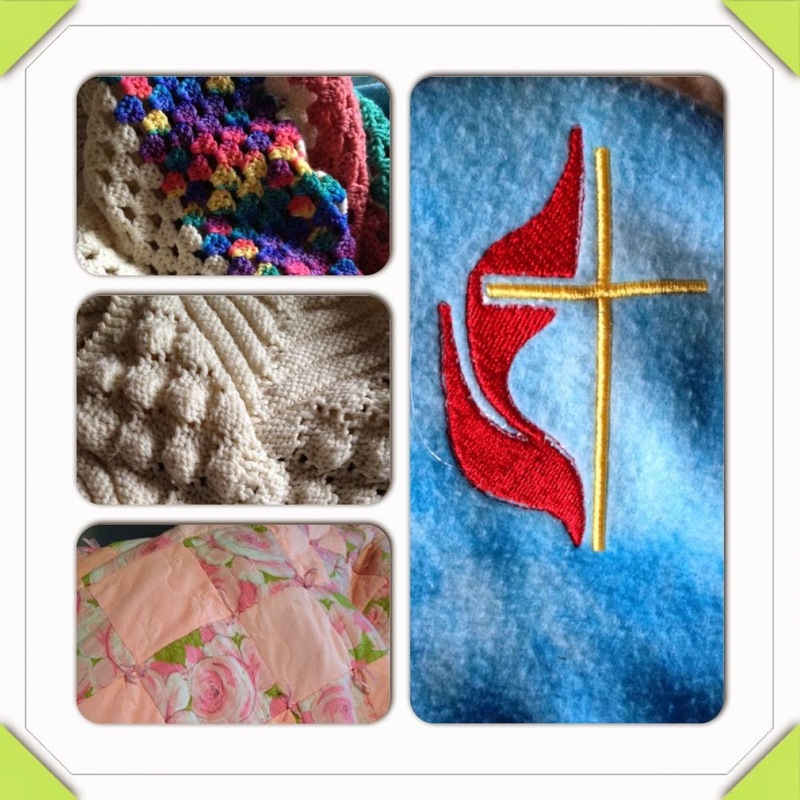 Each of these blankets were made by loving hands, for specific purposes. The top, made by my sister, Penny, and given as a Christmas present one year. Next, a throw crocheted by Steve’s Grandma Babe, given to us (and all her grandchildren) as a wedding present. The pink quilt was crafted by my great aunt, and given to me as a graduation present. And finally, a prayer blanket, lovingly crafted by Arapaho UMC Methodist Women, and given to me when I had a period of two surgeries in four months time. How could one be cold when this much love surrounds me? How could I not feel loved? Don’t you just know that, buried under those loving covers, I wait patiently for the cold to end, knowing that I have a loving family who will keep me warm – physically and otherwise? The cold…will…end…someday. Zechariah prophesied in Zech 14:6-7 (The Message): What a Day that will be! No more cold nights—in fact, no more nights! The Day is coming—the timing is God’s—when it will be continuous day. Every evening will be a fresh morning. What will your day be like when the cold ends? Who is it that gives a prayer of thanks for the warmth you give? I pray you are wrapped in loving warmth of family, friends, and God’s love while you wait. ← Pssst! When is it appropriate to share a professional secret?